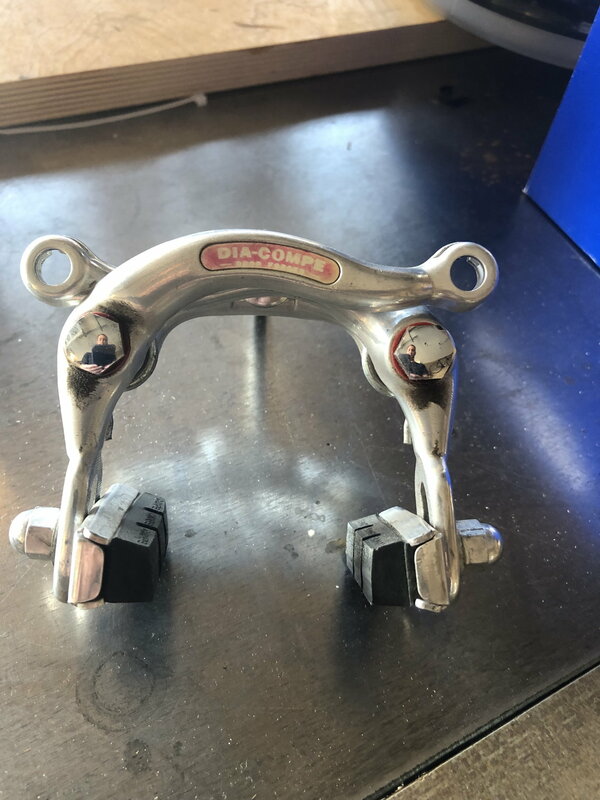 Thought I'd share this - I picked up a pair of Dia Compe Gran Compe centerpulls off Ebay. Seller bought them new and just about had a stroke getting them adjusted and gave up. I put them on my wife's Fuji so I could eventually move away from the 27" wheels. Overall they look nice and weren't really that difficult to adjust as long as you have a helper. They feel more solid than the Dia Comps they replaced, and in my brief testing was able to lock up and lay rubber. I don't know if these compare to the Paul brakes, but I paid 100 bucks for the pair and overall very happy with them. Good calipers to use with fenders or fat tires (I used to race XC using 45mm knobbies with Weinmann 750 centerpulls). Looks like the newer variant does away with the need to ever have to bend the arms, which greatly spares the bushings and sleeves from damage. Since we are being un- scientific I might add that your Fuji is dang gorgeous! Black, chrome elegant. I concur with your review. I have them on my Mercian, and like them a lot. Frankly I was expecting to replace them with dual pivots by now, but I have no complaints. They work well for all conditions, even loaded touring in hilly terrain. I upgraded my pads to Kool Stop Dura type, and I highly recommend that. They are lighter, look better, and stop better than the stock pads. The only issue I've had is the plating on the pivot bolts doesn't really hold up. Mine are pretty oxidized. Not sure what it is but it isn't chrome. Minor complaint though. Now if you had someone braze on studs, they would really be great. I have Grand Bois long reach centerpulls mounted on studs and they are great. The new Gran Comp are similar in that they are based on the MAFAC brakes. The Gran Compe are based on the old Weinmann centerpull pattern, not MAFAC. The Weinmann/DiaCompe/GranCompe calipers are stiffer to begin with compared to MAFAC. It would indeed be trick to have them mounted on braze on studs. Herse did that. The difference in feel I suspect would likely be less dramatic than with MAFAC, but they would look cooler for sure. That seems to be a Dia Compe issue. I have a pair of their ENE bar-end shifters and the bolts heavily oxidized over the last 4 years. 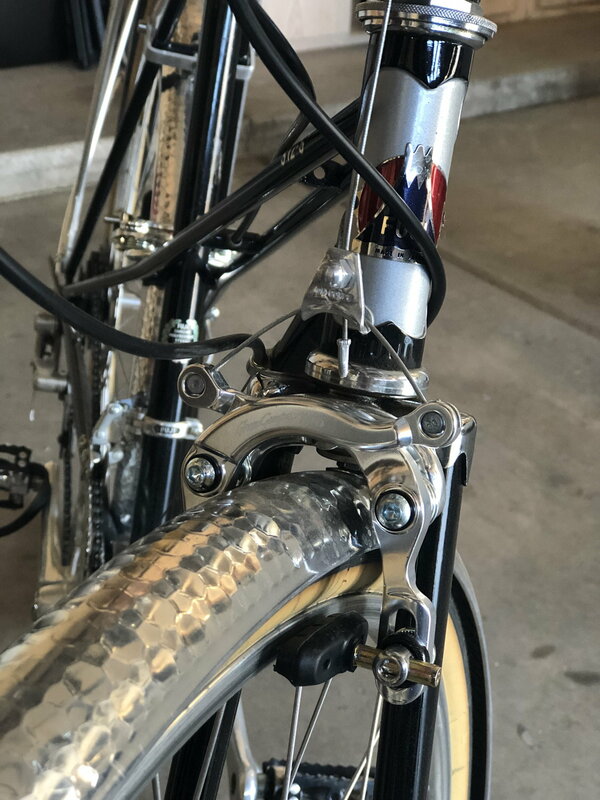 In lieu of having your frame/fork brazed, one can dramatically improve these caliper's actuation stiffness by adding longer bolts and a "booster" arch. 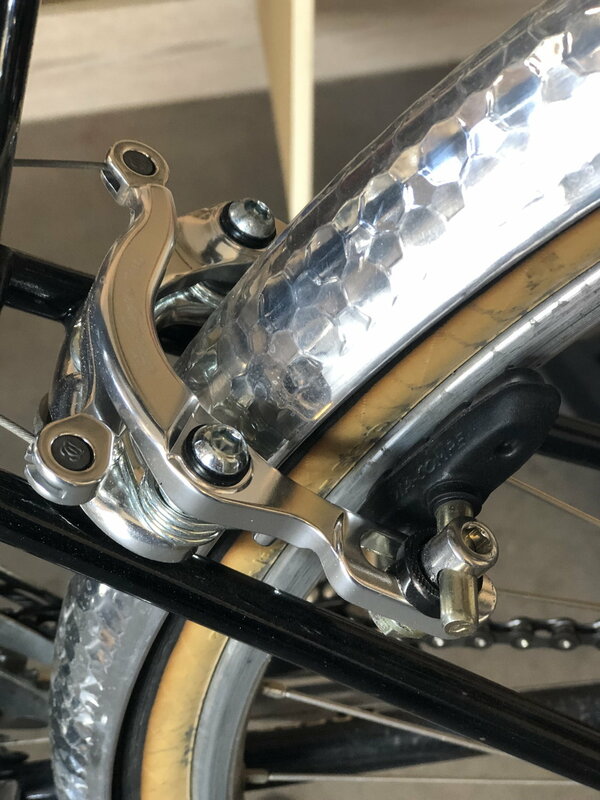 Further, by tethering the arms at the pad mounting bolt, bending forces being fed into the pivots are almost entirely eliminated, leading to a much freer movement with resultant modulation improvement (same logic as top-line Campagnolo and Dura-Ace calipers having ball-bearing pivots). A super-short straddle wire (pillaged from a later canti straddle assembly, one leg of it) can increase leverage, exploiting the gain in stiffness, but requires complete disassembly to install. These brakes are more than stout now, actuated by M730 SLR Servowave(?) levers. I have to say that it was fun to test these mods, back when I was doing XC races using these calipers. Earlier on, it was not uncommon to have the lever come to the grip on steep, wet descents! Interesting to hear that others have done this, too. I used zip ties looped around the fork leg and then through the window of the caliper arm above the brake pad (the adjustment area where you slide the brake pad up and down...hard to explain). Really helped reduce that flex when braking. Are there current makers for the boosters? Can recall Spence Wolf of Cupertino Bike Shop fame carrying and making extensive use of them BITD. Have not seen any modern produced examples. A booster plate is very easy to make, and mine were home-made. If there is a lot of tire clearance, I have even used the broken-off bracket of a waterbottle cage as a brace after only slight reshaping to clear the top of the tire! 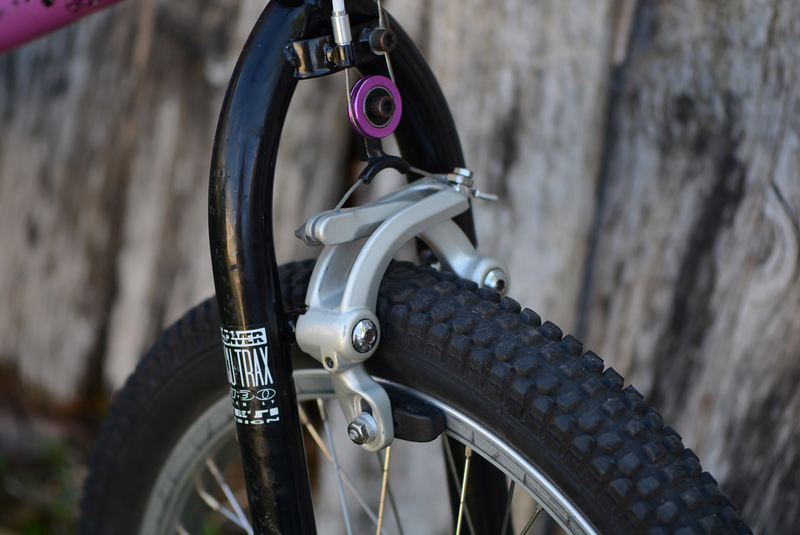 This front canti brace was made from an aftermarket booster brace that I cut the big orbital adjustment hoops off of, thus shortening it up since it was designed for much fatter tires. The one below it was made from scratch, using relatively thin stock, .090" or so. Both helped to prevent brake pad squeal and to make for much more-solid braking feel and modulation. Thanks very much quattro dee! Interesting -- I am very happy w/ the ca. 1960 OEM Weinmanns on my Capos. Now I'll have to compare them with the 1970s brakes in my parts bin. KoolStop pad upgrade is mandatory with almost any make and model of brake caliper. Please report back, John. I also am curious, because my experience in the 70s with old Weinmann and Dia-Compe centerpulls has been that they were poor brakes. But given my level of knowledge back then (none!) I have no idea whether it was the calipers themselves or some other link in the chain that was weak. Those things were made all over the place, I have seen Swiss, French, West Germany, and Japan stamped versions. My 1950 Bates is fitted with pre-'62, single spring Weinmann 750 brakes, pads adjusted near the bottom of the slot. Very solid brakes. 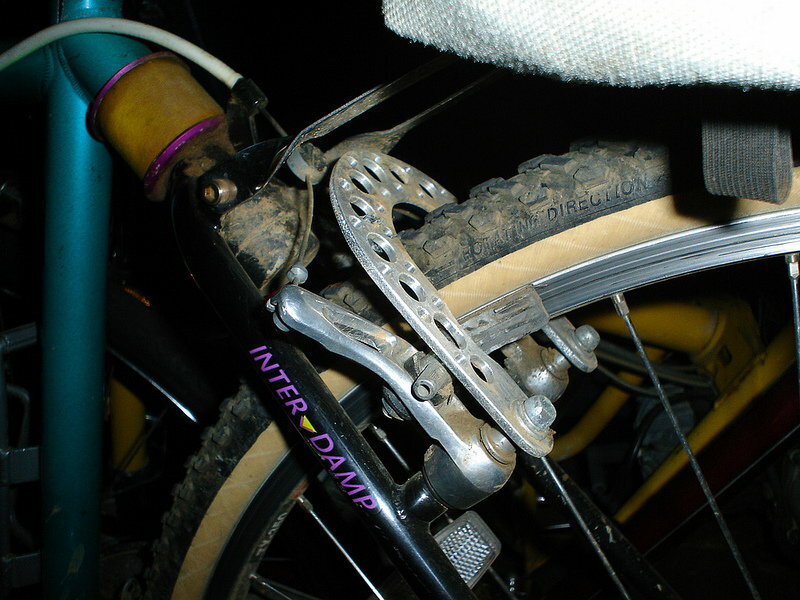 Part of the unique ride of the Diadrant fork is simply the sheer length of the fork blades. At a glance it looks as if the brakes should be frightening and squirrely but there is none of that. Fitted with unknown and very old aftermarket pads. If they ever dry out or give up it will be Kool Stops but the past four years just no need. Every bit as positive and powerful as any of my Mafacs - which of course are all much shorter. Only gripe with those brakes - the levers were too small for my hands. But I didn't get my eyes opened to that fact until I put the far bigger Mafac 2000 levers on my username bike a year later. And my other related the topic: Running those Grand Comp centerpulls (or the equivalent Weinmanns) as a rear brake and running the housing the full length makes them a great match, feel and performance-wise to a Mafac Racer front caliper. 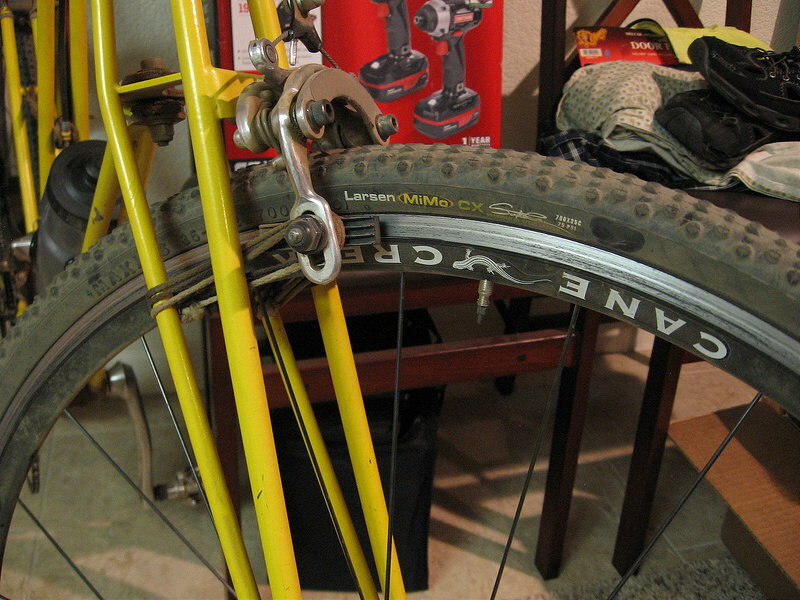 I have Schwinn approved (presumably Weinmann) rears and Mafac Racer fronts on my two winter/rain/city bikes. Those bikes stop really well. Lots of power but very predictable and with great control. A car cuts in front of you and hits the brakes. With a pure adrenaline squeeze, you will stop really fast. (It has never crossed my mind that they needed "boosters". Perhaps I just don't weigh enough.) I like that both the Weinmann (and I presume the Grand Comp) and the Racers can be turned into the other application, front or rear, by just going to a hardware store and buying the appropriate bolt. My two mixed pairs were simple two matched sets from different bikes. 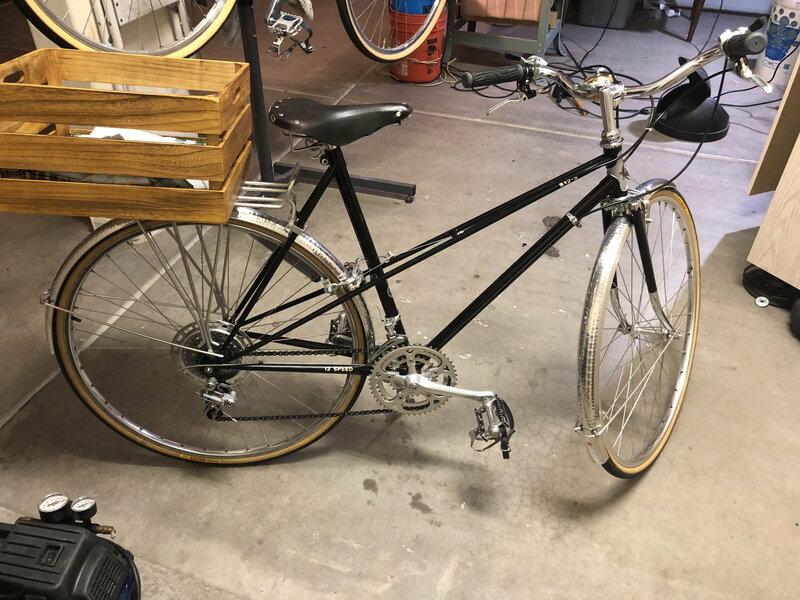 (And my favorite joke, no longer true; you could always get a near NOS set of Mafac Racers for $50 - but you had to remove and dispose of the attached Peugeot UO-8. 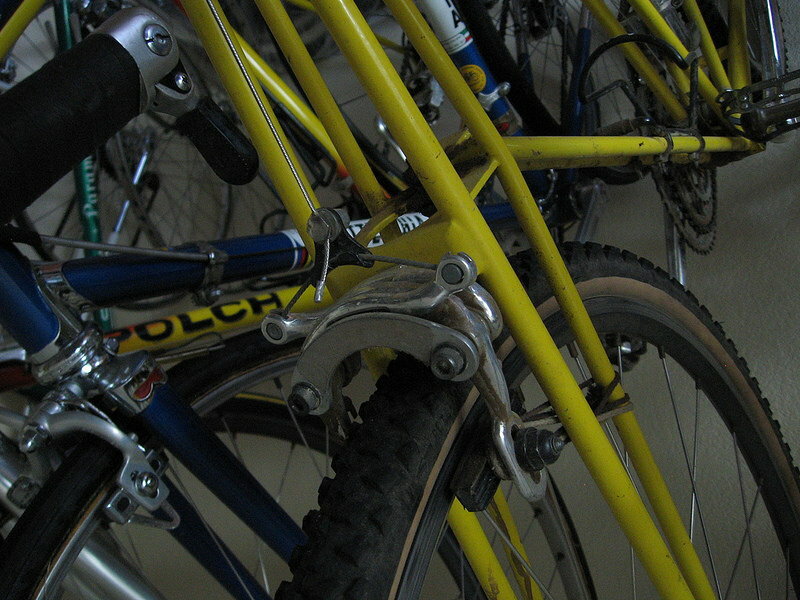 In the '80s, there were hundreds, thousands, of UO-8s bought in one of the bike frenzies and never ridden. 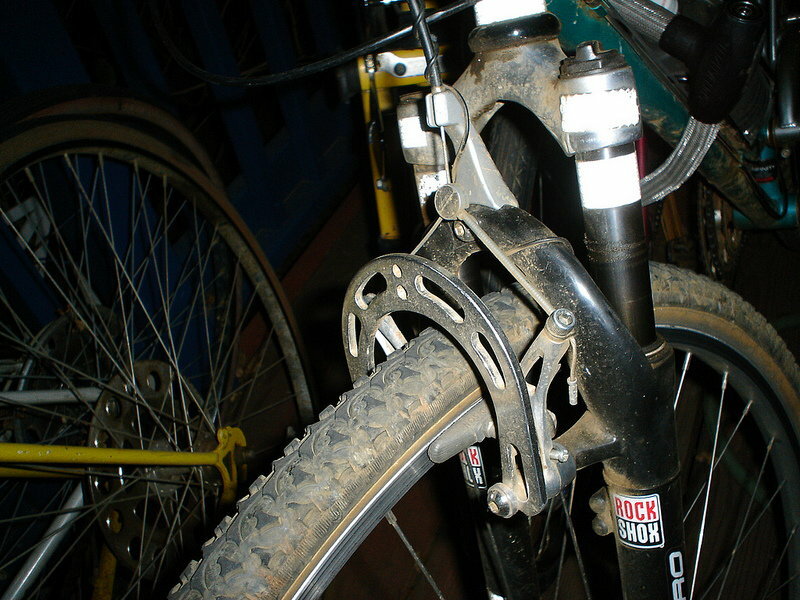 U brakes are center pull too .. Campagnolo Euclid brakes were kind of pretty.. I remember the Spence Wolfe brake boosters well. They came into the LBS where I worked pretty often. The Cupertino bikes usually had them, often along with a custom "alpine" jockey cage Campy NR RD, Super Champ 58 rims with rim ropes (always! ), and tied and soldered spokes. FWIW a quick flex test comparing the new GC610 vs MAFAC racers shows that the former are dramatically stiffer. Therefore I'd assume that boosters would do more for MAFAC performance than for Weinmann/DC/GC brakes. It would be interesting to see how they compare to vintage 60s Weinmanns. I'm not sure if the hearsay about them being based on them is actually true. Might be. Vernier calipers would tell the tale. Another project! I happen to have plenty of 1/4" 6061 plate lying around. That should have sufficient overkill factor. (It's the "another project" I don't need. ... as are RollerCams. I have both on my mtn bike. The way he and Chapman work with centerpulls makes me want to put direct-mount bosses on something fancy. Yeah, you wouldn't believe it, but I got that bike off Craigslist for 50 bucks, came with Campy wheels and some other aftermarket goodies, although I added the Brooks and the box. I rode it around for quite a while before finally admitting it was just too small and giving it to my wife. She now thinks it's as cool as I always did and would never give it up. Her pomeranian rides in the box. There weren’t too many big mixes out there. I think Schwinn had a 23” model, Raleigh too.